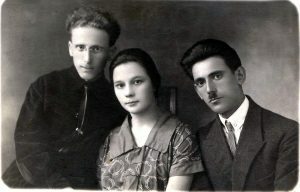 Left to right: Srul (Israel) and Esther Shmunis, Leib Averbukh. Belaya Tserkov. Year 1925. Leib’s full name was Gersh-Leib as I discovered recently from his death certificate. 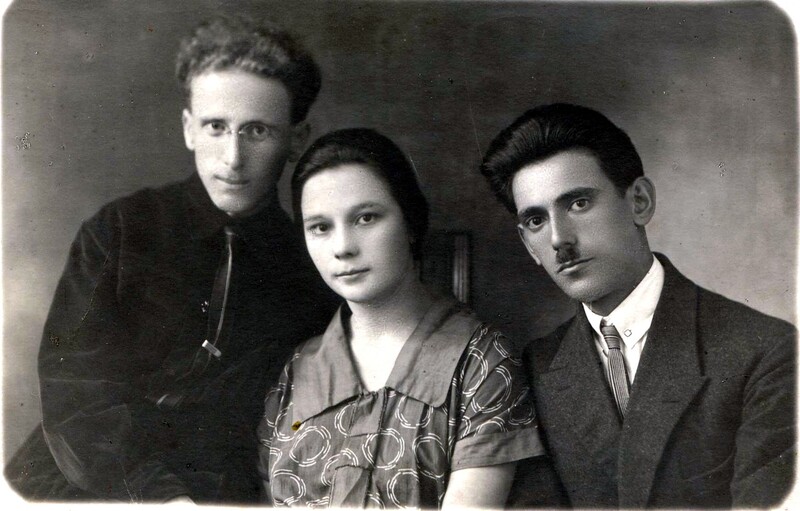 His sisters insisted that their father Velvel had given a middle name only to Leib’s older brother Yankel-Shmul (knows as Kutsya); archive records proved that he made an exception for Leib, as well. Taller than his oldest brother Avrum who had emigrated to America, Leib was eerily similar to him in appearance. And in intellect. Gratified to have a scholarly son again, Velvel was, however, deprived of the chance to homeschool him – it was a different world. Leib was equally talented in hard sciences and humanities but his special ability lay in languages. His classmates, gentiles and Jews alike, conceded his superiority in French, German, old Greek, and, his life-long passion, Latin. But the most important language, Russian – fluent, literary, and accent-less, without the stereotypical Jewish throaty ‘r’ (common to old Russian intelligentsia too, Lenin, for one) – had not yet reached the level he strove to achieve. He still stumbled occasionally unable to find a Russian word that would trump its Yiddish equivalent. Grammatical blunders made Leib cringe; such an error was reason for loss of respect. This sensitivity translated into rather dramatic abandonment of a queue for buckwheat or some other deficit, in spite of investing hours in it, after overhearing somebody’s less-than-grammatically-correct utterance. World War I, the pogroms, and emigration had thinned Velvel’s pupil pool and brought down Sheina-Gitel’s business. The house was made to look vacant: windows shutters closed, the oven cold. Leib began preparing the surviving local Jewish boys for the gymnasia entrance exams – and quickly, a waiting line developed for his services. Letters from his Leningrad cousin made him restless. He asked himself “suppose I prevail – then what?” and saw the answer in library book shelves, university lectures, tall buildings, wide boulevards, fashionably dressed women but his father crushed. He stayed. “Fuhr shon, du darfst fuhren (go already, you should go,)” Sheina-Gitel told him after Velvel’s funeral. Leningrad: Cradle of the Revolution. Leib belonged to meshchane which was almost bourgeoisie. Destitute or not, they were considered exploiters and did not deserve any privileges; they were admitted to college if they aced entrance exams that the deserving did not have to take and if there were vacancies. Of the ruling classes, some had completed rabfak, some were barely literate. Some called for the postponement of studies in favor of destructing railroads built by the Tsar and creating new ones from scratch. The students accused the professors of belittling them by intentionally using words that did not sound Russian, promised to throw the useless relics onto the heap of the history’s discarded trash, to unmask their counter-revolutionary souls. The professors, cold and hungry, in shabby clothes, pince-nez and bowties, paled and stuttered profuse apologies when they forgot to address their students tovarishch. Leib was mystified as to how the deserving masses would be treated after they, and the next generation, got their education and thus lost their proletarian status but it was not the epoch that encouraged questions or, God forbid, doubts. He sensed that “now that you’ve prevailed – what next?” would be construed as incendiary, so he offered his classmates free tutoring instead. They threatened him, a leach on the body of the working people, with bodily harm. Velvel’s son, he did not suffer fools gladly. “If our new balabusim want engineers with this kind of mentality I should not be one,” Leib wrote to Sheina-Gitel. After all, a degree was a profession, not an education. He dropped out of college and vowed to stay far away from the new order so as not to become contaminated or destroyed by it which was, in essence, the same. He spent that first year in the big city dubbed the cradle of the revolution developing his philosophy of life. Several years before, in 1917, when the Bolshevik Revolution whip cracked, he had not imagined the need for a personal philosophy; he embraced the end of the Pale of Settlement, the unencumbered access to cities, the elimination of the education quota. The whip split the world into outcasts and worshippers, the shameful past and the magnificent future of universal harmony and effortless prosperity. Awed Russian Jews adopted that vision unconditionally, numbed like rabbits under a snake’s stare. The only male in the family, not counting Avrum in the far-away America, Leib took on his father’s role of unifying the family’s philosophy. A survey of his sisters’ opinions on the era they lived in returned identical responses: they had already settled on their views. On every visit to us, Leib recited the missives – one, Esther’s, in Russian, three in Yiddish – that he had memorized word for word. It took Leib a long time to find purchase for his feet in the world that boxed him in more cruelly, in some ways, than the Pale of Settlement and to which he and his sisters, unlike the majority, would never develop a hint of the Stockholm syndrome. He found clerical work; rented a bed in someone’s room; walked several kilometers once a month to the post office that accepted parcels to ship food to his mother; strolled down Nevsky Prospect, the central avenue, taking in the architecture; and he read, hungrily, eagerly. Now he inserted Russian into Yiddish. He cautiously made some friends among coworkers and at the library. They talked philosophy and classics and avoided acknowledging the reality around them. To his amazement, well-born gentiles befriended him as an equal. He was even more amazed that women in his new circle marveled at his appearance, education and manners and sought his company. For his part, he enthusiastically sought theirs. Leib was quickly promoted to a bookkeeping position and, as I learned fifty years later, married a golden-haired librarian, a deacon’s daughter, who had a room in a communal apartment. They divorced several years later following the death of their son. Leib did not share his marital news with his family. Sheina-Gitel could handle anything except the knowledge that her son married outside the faith and that her grandson was not Jewish.